“This is our second year in the parade and we had a great time meeting members of the community and seeing current Heartland members,” said Kathy Harrington, Heartland President. "We’re excited to be providing New Prague, and surrounding communities, a money-saving alternative to “traditional banking” and we’re already looking forward to the 2015 parade." The Home Depot has provided an update on breach investigation. We’re excited to announce the new and improved Online Bill Pay system is live. 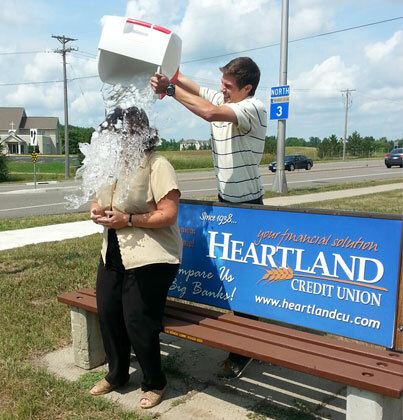 Heartland President Kathy Harrington was challenged by a Heartland staff member to take the Ice Bucket Challenge and then challenged other Minnesota Credit Union Presidents to take the challenge too. Click the “Read More” link to check out the video. Once again the news is buzzing about a data breach, this time, carried out by a group of Russian hackers. It has been reported that this data breach has claimed to have stolen usernames and passwords from a variety of websites across industries. Click the “Read More” link for best practices to protect yourself. We’re excited to announce you can now shop on your mobile device for merchandise, travel and more with the points you’ve earned on your Heartland CURewards Visa. We’re pleased to announce our 9th Annual Heartland Scholarship winners have been chosen. Internet Explorer Vulnerability Announced. What You Need to Know. A new vulnerability affecting all versions of Internet Explorer since version 6 has been discovered. This vulnerability would allow a hacker to remotely control your computer and gain access to files, email, passwords, etc. Read more on tips to protect yourself. Heartland Credit Union sponsored and volunteered for the annual Inver Grove Heights Parks and Recreation Egg Hunt and Coloring Contest. The news is buzzing about this security vulnerability in OpenSSL. Please rest assured that Heartland Online Banking is not impacted by this bug. However, other websites you use may be vulnerable.